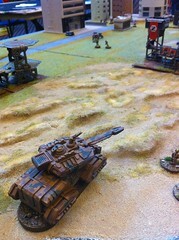 Had a great fun session at the Hammerhead wargames show near Newark on Sunday. Thanks to all of the players that dropped by to talk about Gruntz and for joining in. It was a 4:30am start for me, followed by a 3.5 hour drive and a long day before the journey home. The drive home was terrible with almost 4 hours of British rain (worse than any other kind of rain) on the M1 through the roadworks. It was worth it though! I was lucky to be able to feature a game with Ground Zero Games (GZG) New Israeli troops versus some Critical Mass Games (CMG) Arc force. The Arc troop objective in the participation game (for show attendees) was to take out a fuel depot whilst fending off the the defending NI troops on the beachhead. download in the Yahoo Group. 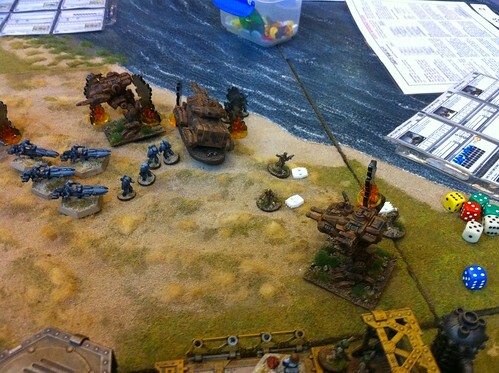 Landing on the beach were the Arc troops with a Grav APC, Medium Grav Tank and two Mecha Walkers including a Scout with chin mount laser and support mecha with missile launchers and twin chin mount rotary auto canons. 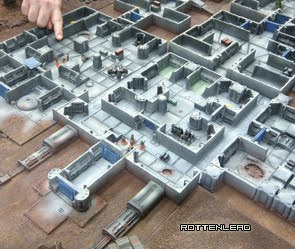 The Arc force also had four squads of rifle troops, some squad attachments and a medic and commander. Some close ups of the "Digital Camo" scheme airbrushed by Craig from Critical Mass Games will be photographed this week and added to the Flickr gallery. The defending New Israeli force had a Bulldog APC and a Paladin II Hi Mobility tank with a High Energy Laser (HEL) as the main weapon. A Commander, Medic and one squad of hard suit troops provided additional defence. 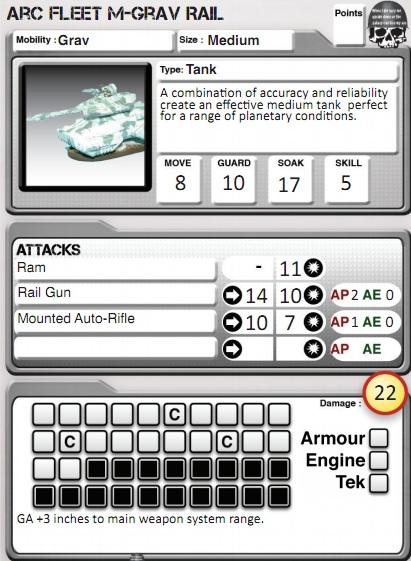 They also had a VTOL with a unit of powered armour pre-loaded for delivery to any key location on the board. In most games the attacking player forgot their objective! The Arc troops mostly wanted to get happily engaged with the NI, taking out defending units, rather than pushing forward to destroy the fuel depot. 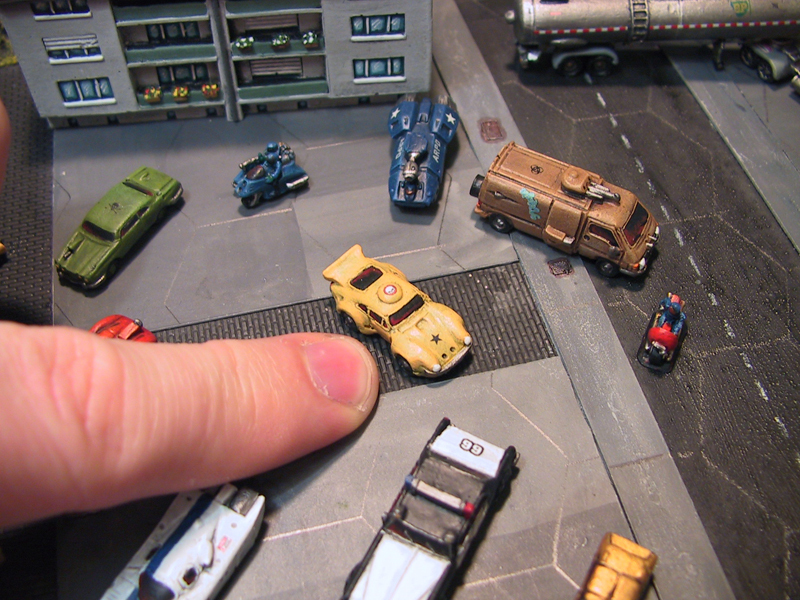 This was not an issue though, because players had some fun trying to knock out vehicles and learning the game. 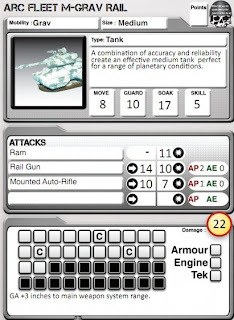 In the last session the Rail gun equipped Grav tank did push forward but ended up in a smoking ruin do to excellent use of two of the Missile carrying powered armour troops dropped by the NI player. 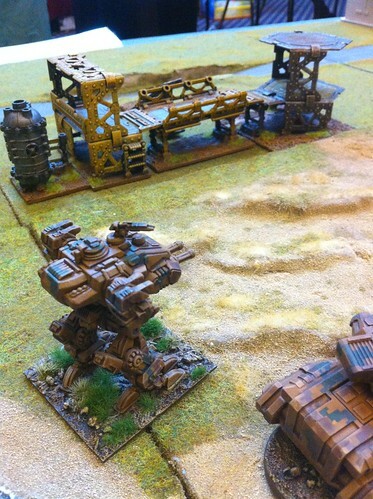 The most fun in my view were the mecha walkers, which not only looking stunning (Thanks to the paintwork by Craig at Critical Mass) but also performed really well on the battlefield. I can't stress how good the Critical Mass Games vehicles look in the flesh. I would go as far as to say that their web site does not do them justice, because they look "larger than life" on the web, making look bigger and less detailed than they really are. When you actually get your hands on them you can see how good they look in the fine 15mm scale. Gushing model admiration aside they are also in perfect size/scale with the GZG ranges. On a related note I have decided to base my Gruntz units on pennies which are a perfect weight and size for 15mm. Specialist units like Medics and Commanders are then on the larger 2pence pieces to make them more visible on the table. A video of the entire event is coming soon, with a tour around the show and the various goodies on the trade stands and demo tables. There was a stunning looking Martian war of the worlds "1940's" style game on which I snapped some video of which was an inspiration. The video of the event will be up soon, hopefully tonight if I get the time.